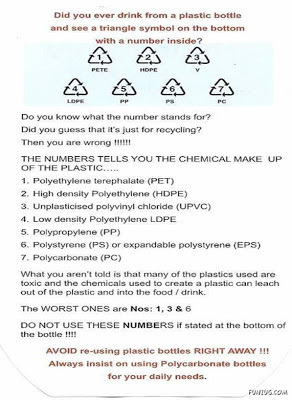 What does those symbols mean that are imprinted on each of the plastic bottle that you drink ? 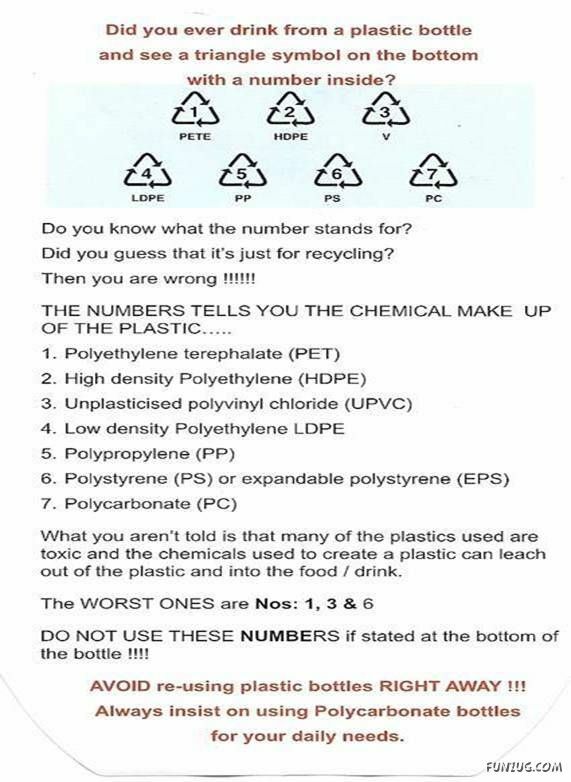 Yes, these odd number 1, 3 & 6 have special notation .. the plastics likely to contain BPA (Bisphenol A), a carcinogenic substance. Try not to use it for your baby, no doubt PC is a good durable plastics. Why Women in China do not get breast cancer ? This interesting article is extracted from 'Your Life in your Hands', written by Professor Jane Plan. It is indeed worth sharing with everyone, including men too. I am sure many will laugh at the findings by the said Professor, or totally disagree about the causes of such outcome. Nevertheless, it might be the actual cause, one never knows. Anyway, the decision is in your own hand. I had no alternative but to die, or to try to find a cure for myself. I am a scientist - surely there was a rational explanation for this cruel illness that affects one in 12 women in the UK ? Why didn't Chinese women in China get breast cancer ? It is not just a matter of China being a more rural country, with less urban pollution. In highly urbanized HongKong , the rate rises to 34 women in every 10,000 but still puts the West to shame. The Japanese cities of Hiroshima and Nagasaki have similar rates. And remember, both cities were attacked with,nuclear weapons, so in addition to the usual pollution-related cancers, one would also expect to find some radiation-related cases, too. I then, discovered that whatever causes the huge differences in breast cancer rates between oriental and Western countries, it isn't genetic. Scientific research showed that when Chinese, or Japanese people move to the West, within one or two generations their rates of breast cancer approach those of their host community. The same thing happens when oriental people adopt a completely Western lifestyle in HongKong . In fact, the slang name for breast cancer in China translates as 'Rich Woman's Disease'. This is because, in China, only the better off can afford to eat what is termed ' HongKong food'. The Chinese describe all Western food, including everything from ice cream and chocolate bars to spaghetti and feta cheese, as "HongKong food", because of its availability in the former British colony and its scarcity, in the past, in mainland China . According to figures from the World Health Organization, the number of men contracting prostate cancer in rural China is negligible, only 0.5 men in every 100,000. In England, Scotland and Wales , however, this figure is 70 times higher. Like breast cancer, it is a middle-class disease that primarily attacks the wealthier and higher socio-economic groups, those that can afford to eat rich foods. "The Chinese don't eat dairy produce !" Suddenly, I recalled how many Chinese people were physically unable to tolerate milk, how the Chinese people I had worked with had always said that milk was only for babies, and how one of my close friends, who is of Chinese origin, always politely turned down the cheese course at dinner parties. I knew of no Chinese people who lived a traditional Chinese life who ever used cow, or other dairy food to feed their babies. The tradition was to use a wet nurse but never, ever, dairy products. At the time we were all delighted and ate extra portions ! Following Peter's and my insight into the Chinese diet, I decided to give up not just yogurt but all dairy produce immediately. Cheese, butter, milk and yogurt and anything else that contained dairy produce - it went down the sink, or in the rubbish.